Cast Includes: Tom Connor, Cheryl Fergison, Michael Fletcher, Matt Ganey, Sam Haywood, David Heywood, Barbara Hockaday, Paislie Reid, Katia Sartini, Christina Tedders. A naive Irish girl with her heart set on New York stops off in Liverpool where she loses everything she owns and finds a friend in local thief, Charlie. Taking her on an adventure of love, loss and drama, leaving her thinking. Will she ever make it to the city of her dreams? After ten years in the making, Bob Eaton and Sayan Kent’s baby ‘Maggie May’ is brought into the home of Liverpudlian theatre, The Royal Court. The perfect place to introduce a story of true Liverpool heart and passion. The story begins as the charming Maggie May (Christina Tedders) is introduced to the streets of Liverpool and her plans for New York are thrown astray as she is flung into the deep end of work mixing with the socialist and capitalist society, earning an honest (and later, a not so honest) wage. The Court’s newly revamped revolving stage takes us to a range of sets around Liverpool, with the most impressive being Mr Campbell’s library and the main area of the house. Multi-talented cast members mix, match and switch up multiple instruments throughout the entire performance as easily as they breathe, making my ability to play twinkle little star on the keyboard appear futile. The first act ends powerful with the commencement of war, the room blaring with gunshots, Maggie’s loss of innocence and the beginning of a new life. The cast share a spine-tingling harmonisation of vocals and an excitement of what’s to come in the second act, as noticed throughout the buzz of the audience. 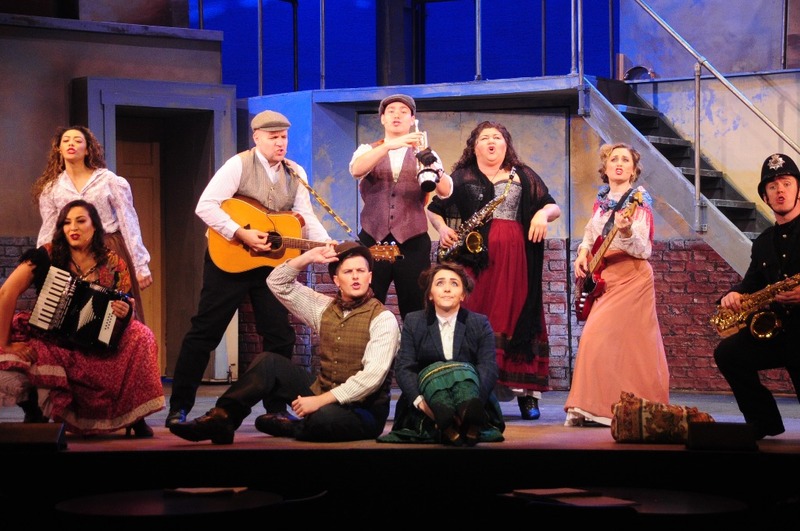 With Michael Fletcher’s heart-breaking portrayal of shell shock; Cheryl Fergison as the hilariously perfect drunk, Paislie Reed’s sassy and authentic representation of the working class and Christina Tedders moving and endearing Maggie, the cast of Maggie May, are the paramount of theatre. Maggie May is at the Royal Court Theatre, Liverpool, until Nov 10. BSL performance is on Tuesday 23 October. Audio described performance is on Wednesday 24 October.